The motors and servo motors are the arms and the legs of your project. Thank to motors, you will be able to gives life in your assemblies, your project would will be capable to make tasks for you. 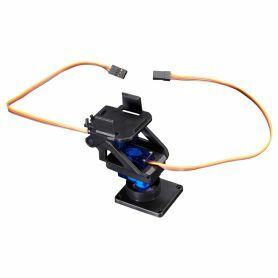 With the servo motor, they will be placed at a given angular position, the stepper motor would only turns of a given angle upon electronic's order and DC motor (hobby motor) would be able to propel any plateform. Motor & robotic There are 12 products. The DC Motor are certainly the most simplest motors for Maker activities. Just apply a voltage and they start to rotate. If it turn the wrong way just invert the connexion and it will turn the other way. The most significant usage of such motor are is robotic propeling. Such motors also exists with gearbox. Gearbox decrease the motor speed and increase the torque on the shaft. Such motor can easily be controled from electronic with a H-Bridge like the L293 (L298) or even with more advanced motor controler board. 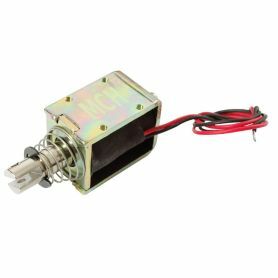 The stepper motors are usually used in printer/CNC/robotic applications! Such motor have a quantified rotation angle for each "rotation step" made by the motor. With stepper motor, you can precisely quantify the needed rotation angle. 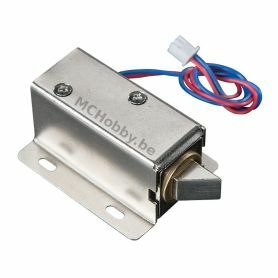 The most usual stepper motor have 200 steps per revolution (meaning 1.8° per step). Such motor are heavier, lower torque and required adequate electronic components to control them. The microcontroler will have to send the needed pulses (steps) to move the motor's shaft. 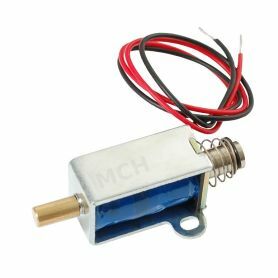 The micro-stepping, widely knows nowadays thanks to 3D printer, would increase the motor's shaft positionning by simultaneous controlling the current in the motor's coils. Thanks to micro-stepping, it is possible to divide the 1.8° step by 4, 8, 16, 32 and even 64, 128 with high precision stepsticks. It is the kind of motor that can be used to control traps, pan-tilt, light tracker, robotic arm, robot leg, etc. A servo-motor is a DC motor having an enslavement electronic used to finely orientate the shaft between 0 or 180° angle. The positionning is sent to the motor with pulse signal having a period of 2.5ms (so repeated every 2.5ms). The pulse width (in the period) indicates the desired angle. The microcontroler usually needs some help when they need to control motors. This is because the motors are consuming lot of current (or power) and that microcontroler are not taillored for such amount of current. Thankfuly, they are Motor Controlers! 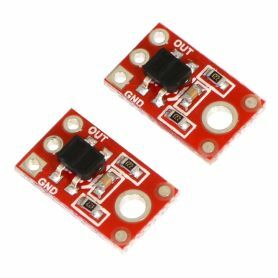 They can be as simple as L293, L298 or more advanced board, the motor controler are there to ease your life by taking care about all the stuff related to motor power control. 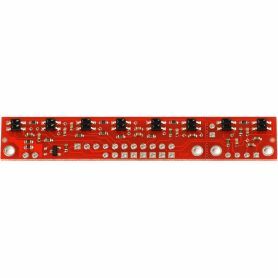 With thoses board and breakouts you will ba able to tame DC motors, stepper motors, servo motors, etc. All you need to motorise your project and made it autonomous in our human world. The robotic prototyping concerns all those stuff used to create your own robot or robotic assemblies. 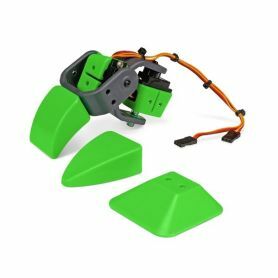 This category contains wheels, tracks, robotic plate, spacer, screws. So, the Alibaba's cave for robotic projects. 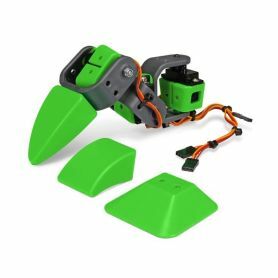 The Romi product line and accessories based on the versatile Romi chassis and is a GREAT STARTING POINT to build mobile robot. Romi is based on a differential-drive platform of 165 mm diameter integrating a battery holder for 6x AA batteries. The driving wheels are located on each side at the middle of the chassis allowing to turn or spin in place. The rear ball caster at the rear offers a third point of contact for stability (an optional ball caster can also been included in the front of the chassis). Romi is propelled with Mini Plastic Gearmotors and 70×8mm wheels. As the motors have backshafts, the Romi can also receive quadrature encoders to enable position feedback. This product is being translated Déplacer les fluides d'ici vers là en toute sécurité avec cette belle petite pompe.